The Montpelier Historic District is comprised of four buildings: the city hall, the Church of Jesus Christ of Latter Day Saints’ tabernacle and the middle school with its gymnasium. These buildings front on Washington Street and are distinct from the surrounding residential area in their scale, materials and function. All are two-stories high, constructed of brick. The neo-classical revival style city hall is the oldest building in the district and is distinguished by its portico with pairs of Tuscan columns. It is built of buff brick made by the Ogden, Utah Pressed Brick and Tile Company. A year after the city hall’s completion (1918), the semi-circular LDS tabernacle was begun on the adjacent corner. This red brick structure employs classical motifs including round arched entries with ornate Terra cotta tympanums. The tabernacle is the city’s largest auditorium. The middle school was constructed in 1937 as a Public Works Administration project on the land opposite the tabernacle. Constructed of mountain red variegated tapestry brick, the building is distinguished by its extensive and profusely ornamented Terra cotta trim. Bear Lake Valley had long been known as a potential settlement area and the first vanguard of Mormon colonists hit the valley in September, 1863. The following spring, 1864, the first sixteen families crossed over the Montpelier area to establish a fledgling community. Within the first year, businesses had begun along Fourth Street. It was a choice location because of the Oregon Trail travel that was still quite heavy. Travelers on the trail tell of the availability of fresh produce, dairy products and beef. With the arrival of the railroad, the first dent in an all Mormon population occurred and soon two communities developed, known as “Uptown” or “Mormon” Montpelier and “Downtown” or “Gentile” Montpelier. Montpelier served as a home terminal for the trains, crews and subdivision point until October 1, 1972 when the terminal was moved to Pocatello. Like most western communities, the town name was changed numerous times. First known by the Oregon Trail travelers as Clover Creek, it later became Belmont and finally was given the name of Montpelier by Brigham Young after his birthplace in Vermont. 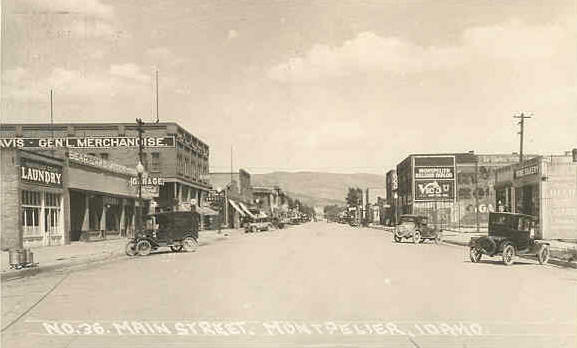 By 1900, Montpelier, largely due to the railroad, had grown to the largest city in the Bear Lake Valley and had captured most of the business of the Valley. It remains so today with a population of 2,867. The Bear Lake County School District and the Bear Lake Regional Hospital are the largest employers in the valley. Step into the Days of the Oregon Trail by taking our simulated Wagon Trail Adventure. Peg Leg Smith Trading Post gift shop, exhibits and the Rails and Trails Museum. The Allinger Community Theater offers concerts and events.